This painting was one of 50 supper box pictures at Spring Gardens, Vauxhall. They each formed the back of one 'arbour' or supper box, an ornate wooden shelter formed of two side walls and a roof, framing picturesque views through the Gardens, where guests could take supper. At a certain moment in the evening's entertainment, the paintings were `let fall' to enclose the diners at the back. The front was left permanently open for the fashionable occupants to view and be viewed. One of the ancient customs observed on May Day that persisted until the early 19th century was the 'Milkmaid's Garland.' The milkmaids would dress in their best clothes and dance in the streets for their customers. A donation from the customers and from passers-by was expected. 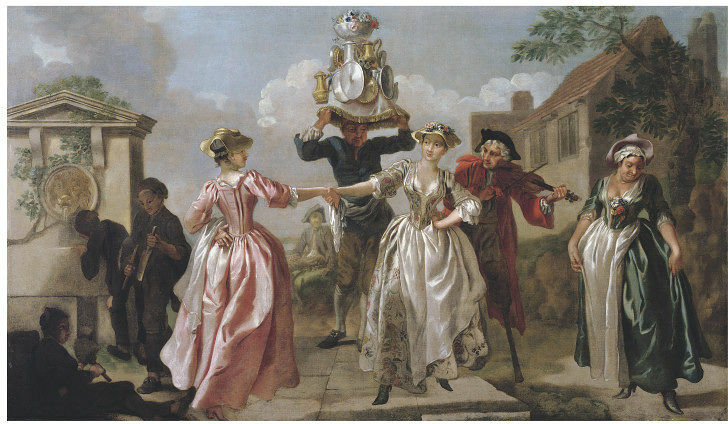 A 'garland' - a pyramid of borrowed silver tankards, plates and flagons decorated with flowers - was paraded by the milkmaids or carried, as in this painting, by a porter. Francis Hayman also included another May Day custom in his picture: that of the young chimney-sweeps noisily beating their brushes and shovels. Francis Hayman began as a scene painter, then turned to portraiture. His first major decorative commission consisted of these large paintings at Spring Gardens, Vauxhall. The commission came from Hayman's patron, the entrepreneur Jonathan Tyers (died 1767), who held the lease on Spring Gardens and was responsible for opening them to the public in 1732. Landscape format painting depicting women dancing to a fiddle player. Purchased with the assistance of the National Art Collections Fund, 1947. Historical significance: Brian Allen, Francis Hayman, Published in association with English Heritage (the Iveagh Bequest, Kenwood) and Yale Center for British Art by Yale University Press, New Haven and London, 1987, p.109-10, cat. no. 30. Prov: painted for Vauxhall Gardens; Earl of Lonsdale; sale, Lowther Castle, Maple & Co., 30 April 1947 (1900) as by Hogarth; acquired by the V & A with a grant from the N.A.C.F. Exh : Montreal, Ottawa, Toronto and Toledo, British Painting in the Eighteenth Century, 1957-8 (24); Liverpool Walker Art Gallery, Painting and Sculpture in England 17°0-175°, 1958 ( 1 2) ; Cologne, Wallraf-Richartz Museum, Englische Malerei der Grossen Zeit, 1966 (23); Iveagh Bequest, Kenwood, The French Taste in English Painting During the First Half of the l8th century, 1968 (34); Sudbury, Gainsborough's House, The Muse's Bower Vauxhall Gardens l728-l786, 1978; Munich, Haus der Kunst, Zwei Jahrhunderte Englische Malerei - Britische Kunst und Europe l680 bis l880, 1979-80 (17); Marble Hill House, May-Day or The Milkmaid's Garland, 1982 (2). Hayman's lively composition shows not only the Milkmaid's Dance but also the young chimney sweeps, who as part of another May Day custom, beat their brushes and shovels in competition with the Milkmaids' fiddler. Of the fifteen or so surviving Vauxhall paintings May Day is the least damaged and preserves a good deal of the lightness of touch which must have characterised Hayman's original canvases in their pristine state. It was J. T. Smith who first observed the similarity between Marcellus Laroon's The Merry Milk Maid, engraved for a series of The Cryes of The City of London, and the porter carrying the garland in this picture. (2) Laroon's series also ineludes The Merry Fidler and The Chimney Sweep, both of whom recur in Hayman's picture. 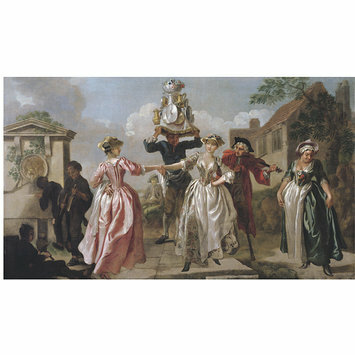 (3) Another of the May Day customs, dancing round the MayPole, was the subject of another of the Vauxhall canvases. The composition of this picture is very similar to one of Hayman's contemporary designs for Sir Thomas Hanrncr's edition of Shakespeare. Perdita in The Winter's Tale is almost identical in pose with the milkmaid between the porter and the fiddler. 1. The Spectator, no. 365, 29 April 1712. For other contemporary accounts of the custom seeJacob Simon, May Day or the Milkmaid's Garland, Marble Hill House (1982). It is also worth noting that a Milkmaid's Dance was occasionally performed at London theatres in the month of May (see The London Stage Part 2 170IJ-1729, 2 vols. (Carbondale, 1960) Il, cf. entries for May 1728). 2. See J. 1'. Smith, A Bookfor a Rainy Day ... &tc. (London, [845) pp. 15-16. 4. See Cyril Cook, The Life and Works of Robert Hancock ... &tc. (London, [948) item 68 repr. " Francis Hayman was certainly familiar with Vauxhall Gardens by 1736, if not before, since in May of that year he painted scenes for Drury Lane Theatre 'after the Manner of Spring Garden, Vaux-Hall with a scene representing the place'. It is not known if Hayman had met Jonathan Tyers by this date but they were certainly acquainted soon after since the National Portrait Gallery's splendid portrait of Tyers with his family is signed and dated '740. Soon after 1740 Hayman must have been commissioned by Tyers, probably with the support of Hogarth, to execute the now celebrated series of supper box paintings which were unveiled at Vauxhall c. 1742. They are first recorded in some verses by the lyric writer John Lockman entitled GREEN WOOD - HALL: or Colin's Description (to his Wife) of the Pleasures of SPRING GARDENS published as an engraved plate with a headpiece like those from George Bickham's The Musical Entertainer. Lockman's text was subsequently reprinted in 'The Gentleman's Magazine' for August 1742. (3) Of the fifty plus paintings recorded (4) eighteen were issued as large engravings with elaborate letterpress verses, probably also composed by Lockman, in the spring and summer of 1743. Tyers' audience at Vauxhall Gardens was largely comprised of the newly literate middle-class public to whom Richardson addressed his novels, and the remarkable variety of subject matter employed by Hayman and his assistants was in some respects a visual counterpart to those developments in literature. The Vauxhall pictures concentrated on the leisure aspect of children's lives. Flying the Kite, Battledore and Shuttlecock, Sliding on the Ice, Leap-Frog and See-Saw are all energetic examples of children and youth at play while Thread my Needle, Hunt the Whistle, Bob-Cherry, Hot Cockles, and The Cutting of Flour were traditional party-games with a particular, although not exclusive, appeal to the young. In the early I 740s the French taste in painting reached its peak in England. (17) Gravelot played a major role by injecting a distinct note of French elegance into the shaky tradition of English draughtsmanship. The Frenchman's characteristically sinuous, spidery line could enliven even the most mundane subject matter. Given Hayman's debt to Gravelot, witnessed not only in his book illustrations but in his early figure style wherein the poses often derive from the example of the graceful and waspish elegance of the Frenchman's assured pencil, we might have been surprised if Gravelot had not been involved with the Vauxhall decorations in some way. Although he did not actually paint any of the large canvases, he certainly designed several of them which, even without other evidence, would be attributable to him on stylistic ground alone. For a few brief years in the I 740S at Vauxhall Gardens could be found the most ambitious expression of that peculiarly elusive style - the Rococo - to be found in England. 1. [Lockman], op. cit. p. 28. 2. The most recent studies of Vauxhall Gardens include David Coke, The Muse's Bower, Vauxhall Gardens 1728-1786 (Sudbury, Gainsborough's House, 1978) ; T. J. Edclstein & Brian Alien, Vauxhall Gardens, Yale Center for British Art (New Haven, 1983); David Coke, 'Vauxhall Gardens' in Rococo Art & Design in Hogarth's England, op. cit., pp. 74-98; John Dixon Hunt, Theatre in Focus; Vauxhall and London's Garden Theatres (1985) and Brian Alien, 'Francis Hayman and the Supper Box Paintings for Vauxhall Gardens' in The Rococo in England (Victoria & Albert Museum, 1987). 3. The Gentleman's Magazine, XII (August, 1742) p. 440. 4. The earliest listing is in the anonymous A Description of Vauxhall Gardens (London, 1762). 5. For Ranelagh Gardens see Mollie Sands, Invitation to Ranelagh 1742-1803 (London, 1946) and recently Giles Worsley, '''I thought Myself in Paradise" Ranelagh and its Rotunda', Country Life (15 May 1986) pp. 1379-1383. 6. The Gentleman's Magazine, XXV (1755), p. 206. 7. Sale conducted by Messrs Ventom & Hughes, 12 October 1841 on the premises (the pictures comprised lots 180-201 and lot 206). 10. A Description of Vauxhall Gardens, op. cit., p. 28. 11. Hogarth's involvement was the basis of Lawrence Gowing's important pioneering article 'Hogarth, Hayman and the Vauxhall Decorations', Burlington Magazine, XCV (January 1953) pp. 4-19.
for British Art (1983) pp. 25-32. 13. The most useful general studies of childhood in the eighteenth century are J. Somerville, 'Towards a History of Childhood and Youth', Journal of Interdisciplinary History, III (1972) pp. 438-447; Ivy Pinchbeck and Margaret Hewitt, Children in English Society, 2 vols. (London, 1969-1973) and The History of Childhood, ed. L. de Manse (New York, 1974). 14. The best edition is The Educational Writings of John Locke, ed. J. L.
15. [Anon. ], Dialogues on the Passions, Habits, Appetites and Affections, &tc., Peculiar to Children (London, 1748) VIII, quoted by J. H. Plumb in his essay 'The New World of Children in Eighteenth-Century England', Past and Present, no. 67 (May 1975) pp. 64-93. Sec also N. Hans, New Trends in Education in the Eighteenth Century (London, 1951). 16. Sec my article 'Watteau and his Imitators in Mid-EighteenthCentury England', loc, cit. 17. See ElIis K. Waterhouse, 'English Painting and France in the Eighteenth Century', Journal of the Warburg and Courtauld Institutes, XV (1952) p. 122 and Elizabeth Einberg, The French Taste in English Painting During the First Half of the 18th century, The Iveagh Bequest, Kenwood (1968). 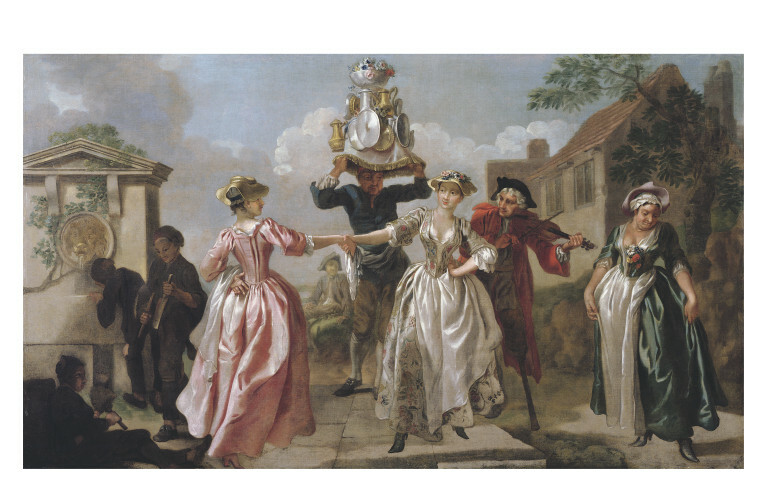 Francis Hayman (1707/8-1776), Decorative painting for a supper-box at Vauxhall Gardens, London: "May Day, or, The Milkmaid's Garland" [Also called "The Milkmaid's Garland, or Humours of May Day"]. London, 1741-1742. "The following list consists of the supper box paintings designed by Hayman and others and executed by Hayman with his studio assistants c.1741-2. The later paintings in the Prince of Wales's Pavilion and in the annexe to the Rotunda have been listed under HISTORY PAINTINGS." Brian Allen, Francis Hayman, Published in association with English Heritage (the Iveagh Bequest, Kenwood) and Yale Center for British Art by Yale University Press, New Haven and London, 1987. Catalogue number 30, pp.109-110. Lawrence Gowing, Hogarth, Hayman, and the Vauxhall Decorations, in The Burlington Magazine, XCV, January 1953, pp.4-19. "... The Grove is bounded by gravel walks, and a considerable number of pavilions or alcoves, ornamented with paintings from the designs of Mr Hayman and Mr. Hogarth, on subjects admirably adapted to the place..." (The Ambulator, 1774, p.181)*. These alcoves, the supper boxes, extended along the north side of the Grove, the east and the south, from which a further short row ran southward. The boxes and their decorations are listed in... The Ambulator in this order; the same order, and the titles given by The Ambulator will be followed here. * The Ambulator; or, the Stranger's Companion in a tour Round London... comprehending Catalogues of the Pictures by Eminent Artists. London (Bew) , p.180 ff., [2nd edition, 1782], p.193 ff. One of many lists of the pictures, printed in guides. This is the fullest of these guides. "The boxes were here interrupted by 'a piazza of five arches' - in the second edition of The Ambulator 'a semi-circle of pavilions' - 'with a temple and dome at each end'. In the centre stood Roubilliac's statue of Handel. Five more boxes completed the south side of the quadrangle:"
The subject is elucidated by Walford (Old and New London, vi, p.450) with the aid of a quotation from Smith's Book for a Rainy Day. Lowther 1947, lot 1900. Victoria & Albert Museum. 54 x 92 in. Entirely by Hayman." Victoria and Albert Museum, Department of Engraving, Illustration and Design & Department of Paintings, Accessions 1947, London: HMSO, 1950.